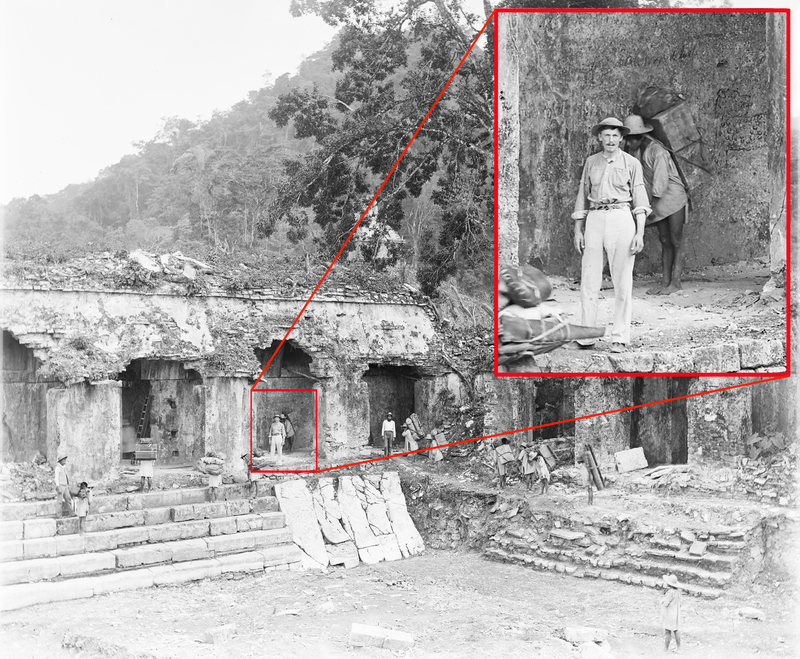 Project Curator Kate Jarvis explains how a new partnership with Google enables us to share and study an extraordinary collection of 19th-century photographs and casts of ancient Maya sites and monuments. Project Curator Claudia Zehrt working on a 3D scan. 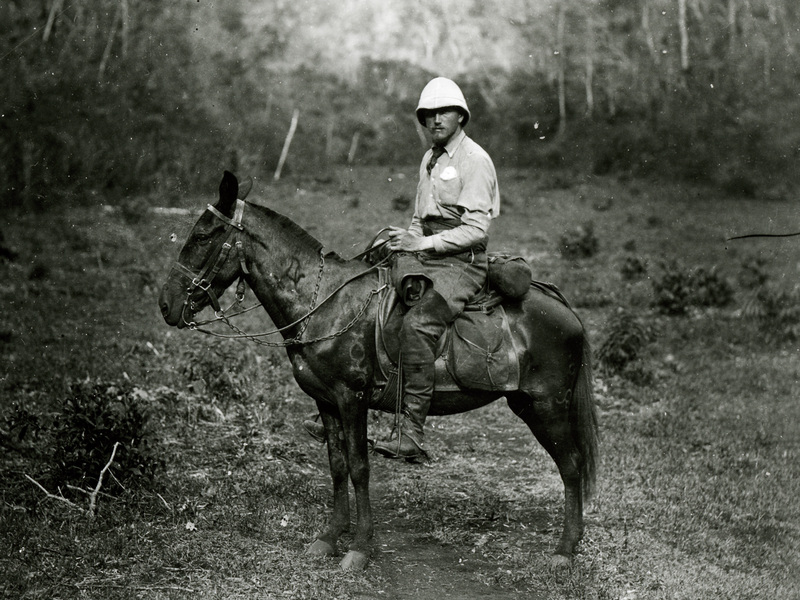 Alfred Percival Maudslay sitting on a mule in a jungle clearing. Photograph taken in Quiriguá, Guatemala, 1890. Alfred Maudslay was born in 1850 to a family of wealthy engineers. After graduating from Cambridge, he travelled to the Caribbean and Central America, stopping briefly in Guatemala in 1872. A chance encounter on his return journey afforded Maudslay the opportunity of entering the Colonial Service. This early career took him first to Queensland, Australia, then to Fiji, Samoa and Tonga. In 1880 he once again crossed the Atlantic to Central America, but whether this was as an idle traveller or with a specific archaeological purpose remains unclear. Maudslay would have been familiar with the work of the American writer John Lloyd Stephens and his travel companion, the English artist Frederick Catherwood. Their own travels through the Maya area had resulted in two internationally successful volumes, containing rich and evocative illustrations of ruined ancient Maya cities, such as Copán, Palenque and Chichén Itzá. 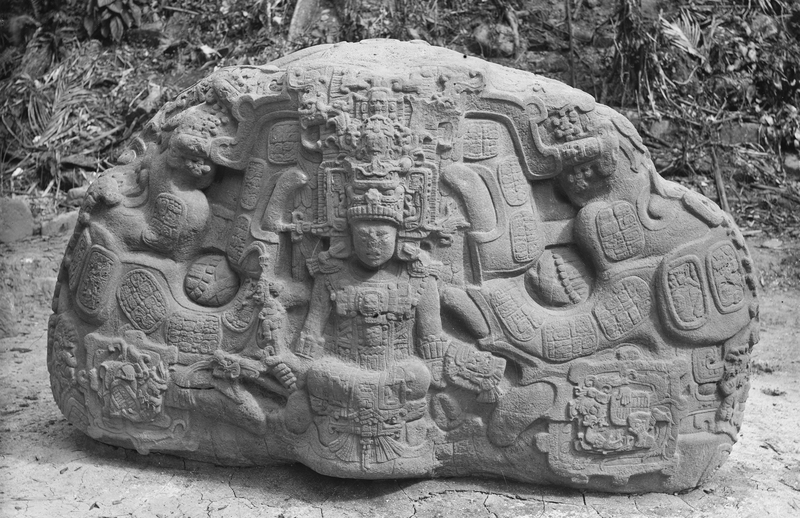 Stela H, Copán, Honduras. Left: Illustration by Frederick Catherwood (1844). Image courtesy of Maya Portrait Project. Right: Cast on display at the British Museum. It was the unexpected magnificence of the monuments which that day came into view that led me to devote so many years to securing copies of them, which, preserved in the museums of Europe and America, are likely to survive the originals. 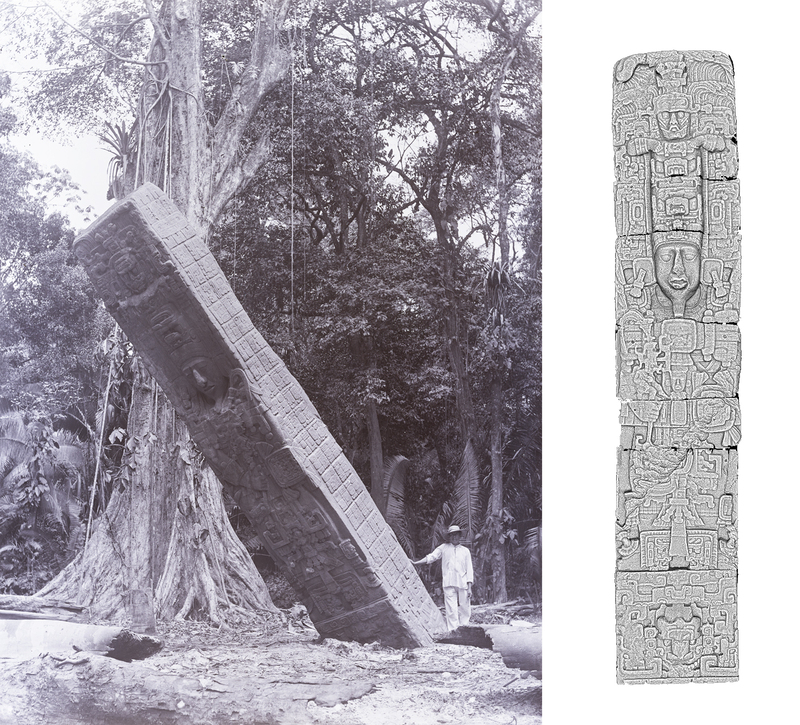 Left: Stela E, Quiriguá, Guatemala. Photo by A P Maudslay. Right: 3D model of the stela. He was driven by the conviction, not widely shared at the time, that the mysterious hieroglyphic writing system of the Maya would one day be deciphered and understood. 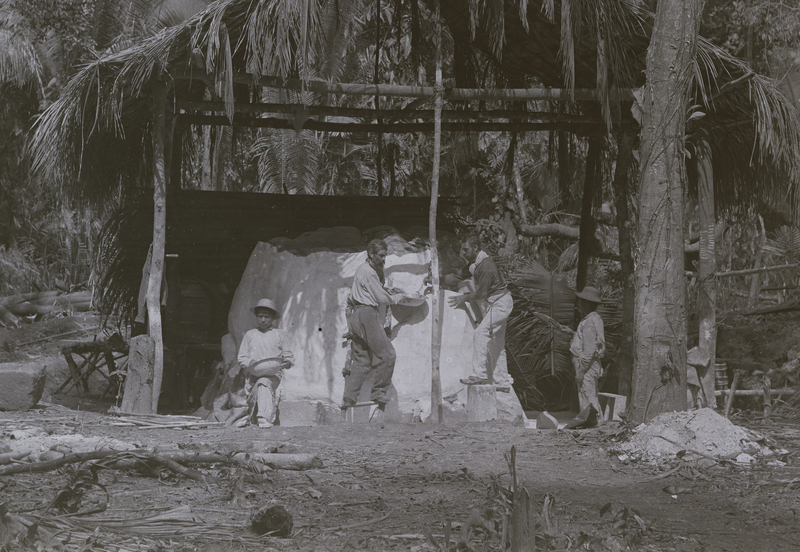 Over the course of a decade, and multiple trips to the Maya area, Maudslay used the most up-to-date technologies available to him – dry plate photography and paper and plaster moulding techniques – to record the sculptures he encountered. The British Museum was eventually the fortunate recipient of this vast archive. Maudslay’s glass plate negative boxes. 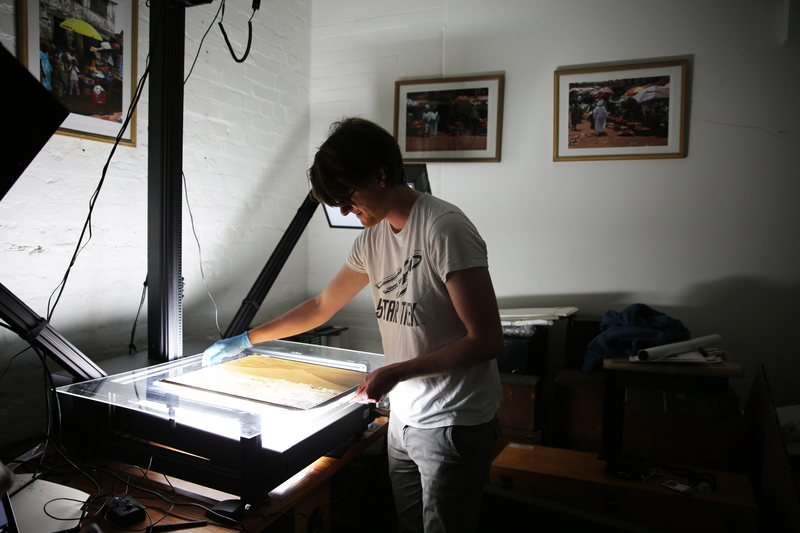 Assistant Collections Manager Jonny Mortemore scanning a glass plate negative. The Palace, Palenque, Mexico. Photo by A P Maudslay. The enlarged section shows unidentified assistant, porter and previously undocumented Jaguar graffiti. A mould was created by the application of moist paper (a bit like papier-mâché) to a low-relief inscription or carving. Once dry, the mould was removed, resulting in a negative impression from which a positive could be cast in plaster back in England. For Maudslay, this was an ideal solution for capturing images of the glyphs, the decipherment of which so drove him. Left: Epigrapher Christophe Helmke studying one of Maudslay’s casts in British Museum storage. 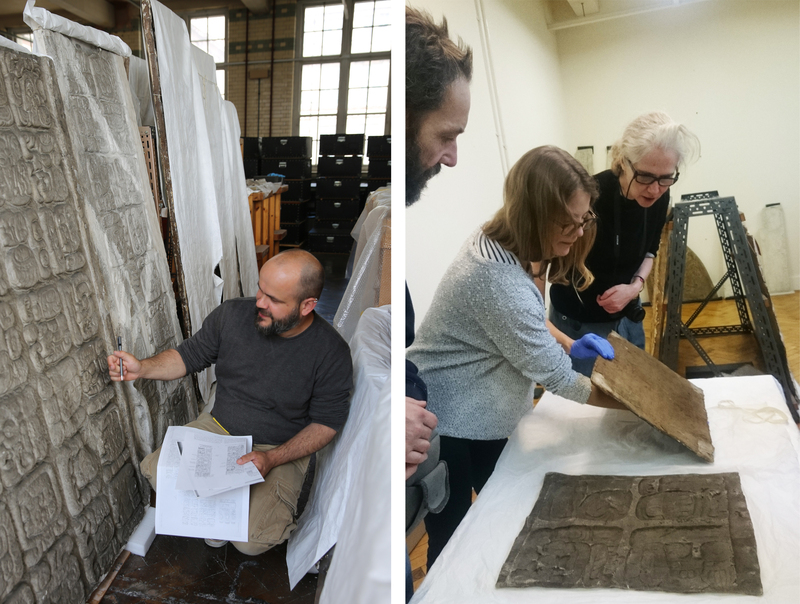 Right: researchers from Central Saint Martins examining the paper moulds with Project Curator Kate Jarvis. Some monuments were too deeply and intricately carved for paper moulding to be practical. Plaster piece-moulding, for undercut or in-the-round sculptures, was a highly skilled undertaking. 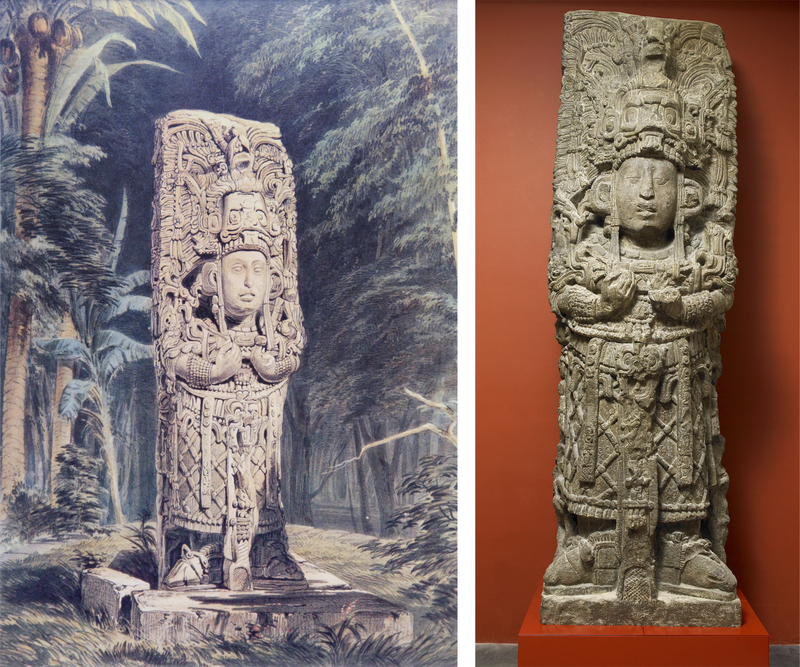 To achieve a complete inventory of monuments from the sites he visited, Maudslay employed a master plaster modeller, Lorenzo Giuntini, who moulded and cast monuments such as Zoomorph P at Quiriguá and Stelae A and H at Copán. Zoomorph P at Quirigua, Guatemala, 1883. Zoomorph P alone required two tons of plaster of Paris to be shipped from England and carried to the site by mule. Lorenzo Giuntini and assistants creating a plaster mould of Zoomorph P at Quirigua, Guatemala, 1883. The two techniques produced three-dimensional replicas that were, and still are, the ultimate resource for epigraphers (scholars studying inscriptions). While drawings are prone to artistic interpretation and subjectivity, and photographs are affected by lighting conditions which can distort detail, casts are near-perfect duplicates of the originals as they were when Maudslay visited them. The intervening 150 years have immeasurably increased the scholarly value of these casts. As Maudslay anticipated, many of the original monuments from which they were taken have been looted, destroyed, or left exposed to weathering and acid rain. Often, details that are so clearly visible on the casts have vanished from the originals, and in a few cases, Maudslay’s casts are the only surviving record of particular monuments or inscriptions. They may not be the ‘real’ thing, but it is imperative that we protect the casts and the information they contain. It is a case of recording the record. 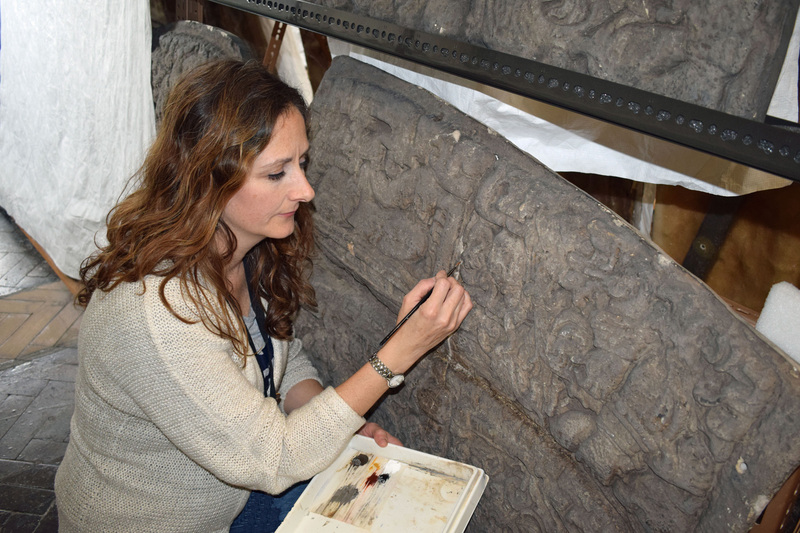 Stone Conservator Amy Drago working on a cast of Quiriguá’s Zoomorph B. The Google Maya Project was born out of both fortune and circumstance. The casts are scheduled to be transferred from their current location in storage in West London. Practical considerations around the continued accessibility of this valuable resource led to a proposal to 3D scan all of the casts and make them digitally accessible to scholars and a broader public. Support from Google Arts and Culture saw our ambitions grow in scope to include state-of-the-art digitisation of Maudslay’s glass plate photographs and field journals, Street View tours and VR expeditions. A bespoke Google Arts and Culture platform now hosts themed exhibits and content, primarily relating to Guatemala, which has been the focus of the project in its first year. Maya archaeologist Claudia Zehrt joined the Americas team as the lead Google Maya Project Curator to direct and manage the project’s output. Christos Gerontinis and Jonny Mortemore, Assistant Collections Managers, have overseen much of the project’s data capture and collections documentation improvements. 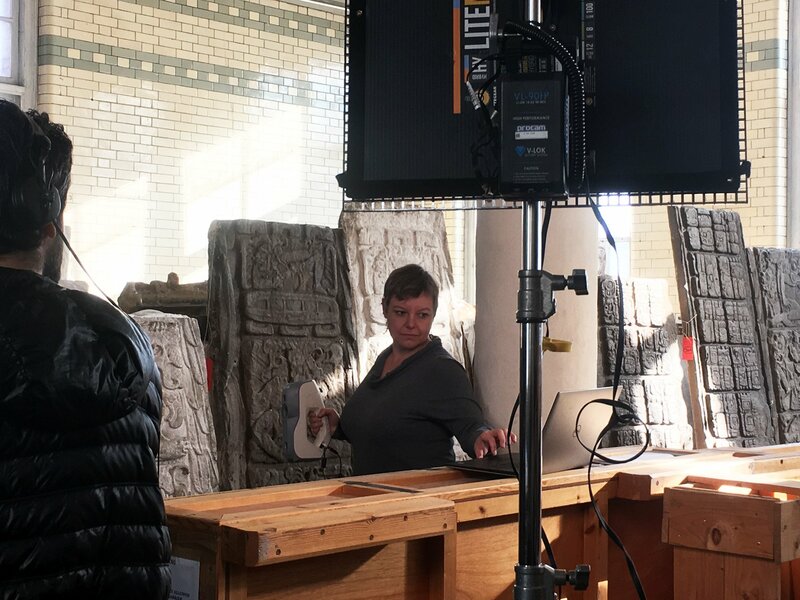 While digital preservation has been the main purpose of the project, the physical conservation of the casts themselves has been undertaken by Amy Drago, the project’s dedicated conservator. By preserving this remarkable heritage, we can start to understand our shared past and think about what it means for our shared future. Follow updates on the exhibition via Facebook, Twitter and Instagram. Use #MayaHeritage #GoogleArts and @britishmuseum @googlearts. Find out more about the project at Google Arts and Culture.